Last week the province honored SCJs who celebrated 60, 50 and 30 years of vows with the Priests of the Sacred Heart. Today, September 14, the Sacred Heart Community at SHML hosted a celebration for SCJs noting 60, 50 and 40 years of ordained ministry. To accommodate the number of guests, the anniversary Mass was moved across the street to Sacred Heart Monastery / Sacred Heart Seminary and School of Theology. The SCJ priesthood jubilarians include Fr. Tom Lind and Fr. 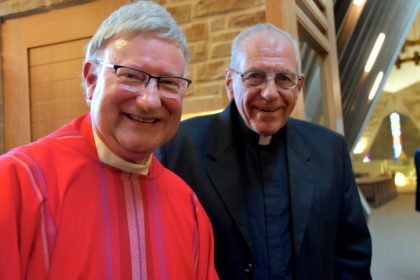 Richard Johnston (60 years of ordained ministry), Fr. Mark Fortner (50 years) and Fr. Jim Walters, Fr. Tim Gray and Fr. Yvon Sheehy (40 years). Fr. Tom, a Minneapolis native, served for many years at St. Joseph’s Indian School in Chamberlain, S.D., before entering parish ministry in northern Mississippi. He is now retired and a member of the Sacred Heart Community in Pinellas Park, FL. Although he spent a few years in vocations and education, most of Fr. Richard’s ministry has been in parishes, primarily in Texas and Mississippi. A Milwaukee native, he is a retired member of the Houston community. Fr. Mark professed first vows as a member of the U.S. Province in 1962 but most of his priesthood, from 1969 – 1999, was spent in Indonesia. Fr. Mark returned to the United States permanently in 1999. He served in formation and in pastoral counseling before retiring and joining the Sacred Heart Community at SHML. Fr. Jim and Fr. Yvon were novitiate classmates; they professed their first vows in 1969. Both ministered for many years in South Dakota, and later, in Wisconsin. Fr. Yvon was pastor of St. Martin of Tours parish (Franklin, WI) and province vocation director. Currently, he is the residential director of the ESL program at Sacred Heart Seminary and School of Theology. Fr. Jim is director of the Hispanic Studies program at SHSST; for many years he served in Hispanic ministry in Texas. Fr. Tim just celebrated his 50th anniversary of vows last year. 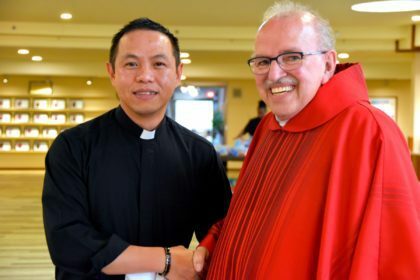 Although he did spend some years teaching and on the formation team, much of his ministry has been among the Spanish-speaking, serving at several parishes in Mississippi and Texas. He is currently associate pastor of Our Lady of Guadalupe in Houston. Click here to view photos from the Anniversary Mass.